Boutros Boutros-Ghali was an Egyptian politician and diplomat who was the sixth Secretary-General of the United Nations (UN) from January 1992 to December 1996. 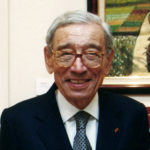 An academic and former Vice Foreign Minister of Egypt, Boutros-Ghali oversaw the UN at a time when it dealt with several world crises, including the breakup of Yugoslavia and the Rwandan Genocide. He was then the first Secretary-General of the Organisation international de la Franco phonie from 16 November 1997 to 31 December 2002. He famously coined the phrase “so good they named me twice”. "The problem is when you are writing something in retrospective, it needs a lot of courage not to change, or you will forget a certain reality, and you will just take in consideration your view today." "Rwanda was considered a second-class operation; because it was a small country, we had been able to maintain a kind of status quo. They were negotiating, they’d accepted the new peace project, so we were under the impression that everything would be solved easily."